Frost is forecast in our area of Nebraska for tonight, so this morning little Mack and I headed out to the garden to do the last picking of the delicate crops. Poor Amalia was under the weather and missed it all. It was overcast, windy, and cold and Mack and I both would have rather been sitting indoors next to the wood stove, reading our respective good books and sipping hot cups of tea, but no. There were lots of tomatoes, peppers, and basil out there that would likely perish this very night, so out we went. I used to do this final picking in a very thorough manner, picking every single last tomato, ripe and juicy or hard and green–I wasn’t going to let a single thing go to waste!–and every single pepper, no matter how immature or snerly, then I’d carefully squirrel them away someplace dark and cool, and then immediately forget about them until one of the kids would remark one day in early spring that there was a box of rotten tomatoes in the basement, and that it was starting to stink, too (oops). I pick any tomato that is turning color or is ripe, and use it up as soon as possible: hooray, I have just enough for one more batch of salsa! I only pick and save the green tomatoes that are of a good size, and are flawless. Flawed or cracked or bird-pecked green tomatoes will spoil before they ripen, and basically aren’t worth the trouble. You can quote me on that, Gentle Reader. I put my green tomatoes in boxes, one layer deep, in a cool spot, using them as they begin to ripen, and/or tossing to the chickens the ones that turn in the other direction. With temperatures in the 50s, your green tomatoes will ripen in 3-4 weeks. Lower temperatures will result in lower quality tomatoes. Higher temps (you guessed it) will help your tomatoes ripen faster. Don’t, under any conditions, place your homegrown tomatoes in the refrigerator. Just don’t. Your tomatoes ripened off-the-vine won’t be as tasty as the ones that ripened on the vine, but they’ll still be better than store-bought, Gentle Reader, and you can quote me on that point, too. 🙂 I like it when I’m having a quotable day. And the peppers? They can be left in a cool spot, too, and left to ripen if they aren’t yet the color that you were hoping for. But keep an eye on them, too, lest they succumb to bugs or whatnot and turn to the Dark Side. Now just a quick note: there is this mistaken notion floating around that my children never misbehave. Pardon me while I clean up the bulletproof coffee that I just sprayed all of the computer screen (not really, honey, relax). Here’s anecdotal evidence that my children–especially this particular one–are just as ornery and stubborn and sometimes even as difficult as anybody else’s, bless them. I fixed him with a steely stare. 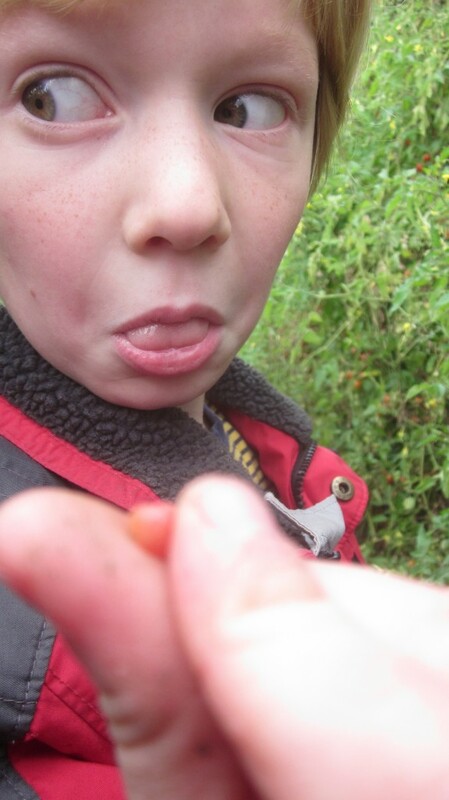 There were hundreds (perhaps thousands) of cherry tomatoes hanging right in front of his nose. This was the easiest chore that I could ever ask him to do. I wasn’t letting him out of it. I knew that I had to outstubborn my stubborn son. Not an easy task, but I was having a good day. I was up to the task. “Plink-plunk-plunketyplinketyplinketyplunk!” went the tomatoes into my bucket. I stripped handful after handful of cherry tomatoes off the vine. Mack moaned and sighed and cast longing glances at his little bike, just on the other side of the garden fence. “Plink . . . .” went a tomato into his bucket. After about twelve seconds, I heard him let out a moan. “Mommmm!” he moaned. 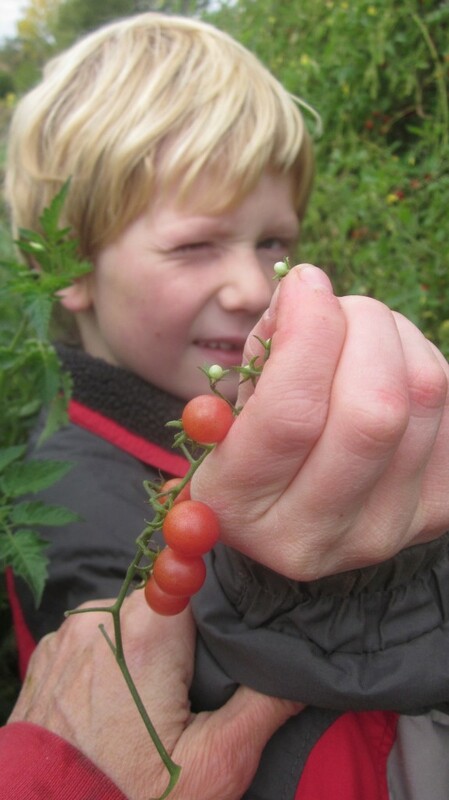 “It’ll take me FOREVER to pick a bucketful of THESE!” Of course my son had found the tiniest spray of the tiniest currant tomatoes in my garden and was picking them. What a cheeky lad. But his moaning didn’t stop, and his picking didn’t resume. “I’m cold. It’s windy! I’m . . . so . . . . so . . . hungry! !” he moaned, piteously. I turned my deaf ear towards my cold hungry windbeaten (stubborn) little boy . . . and walked to a different row of tomato plants, thinking that if he wasn’t right next to me, he’d put his energies into picking tomatoes and not into fabricating new things to complain about. And that’s when I spotted the dead opossum. Then the mood of the picking party turned. The sun came out. The wind stopped its tireless journey across the plains. All yawning hunger was stifled. We found a dead opossum. * The day would be a fine one, after all. A baby opossum sports a pinched face that only a mother opossum could love. Or a 7-year-old boy. 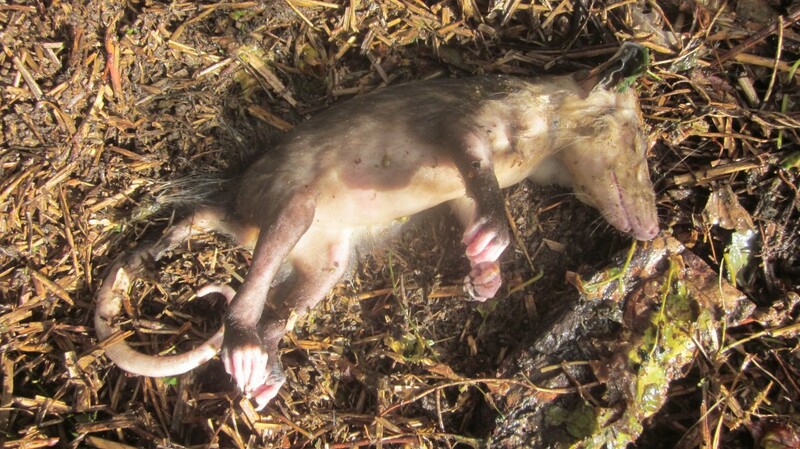 A young opossum had drowned in a bucket of rainwater. From the looks of things, we decided that he had perhaps been leaning down, down, down for a drink, lost his footing, and then couldn’t get out. Because we regularly trap opossums here at our place, and I’ve actually found one, more than once, in the chicken coop with a dead chicken in its mouth, we’re not fond of these overgrown rodents here. In fact when we were having our summer-long tussle with the Dreaded Varmint last year, it was a big (very well fed) opossum that we finally caught in our live trap. But it always makes me sad to see a little baby of any species, dead. We pulled the little guy out of the rainwater and studied him for a time. We both felt a small measure of sadness over his untimely demise. We took pictures. I agreed. Then we both went back to picking, and Mack chattered happily while he filled his bucket. Most of the way full, anyway. It’s pretty amazing what that little dead opossum did to his spirits. Don’t ask me why. Please don’t ask me why. 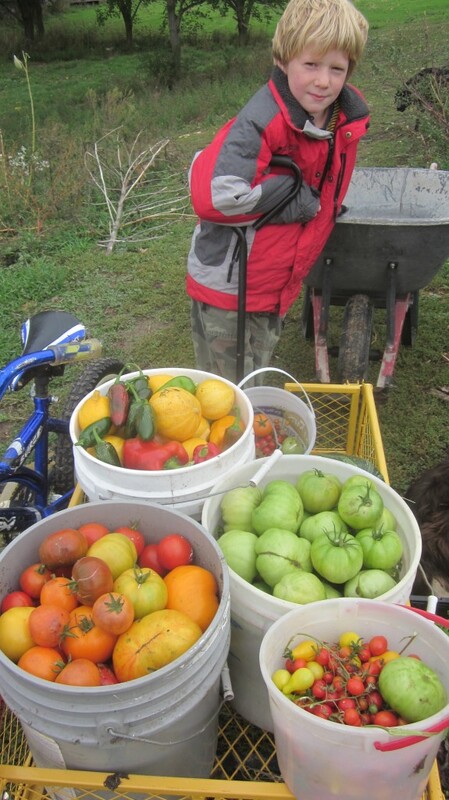 Here’s most of our last pickings: summer squash, peppers of every color and variety, green tomatoes, ripe tomatoes. Note the proximity of Mack’s bike. It matters not that the frost came a bit early for your tomatoes to fully ripen: make lemons out of lemonade, and fried green tomatoes, out of those green tomatoes! Slice tomatoes ½ inch thick. Discard the ends. Whisk eggs and milk together in a medium-size bowl. Scoop flour onto a plate. Mix eggs and milk in bowl. Put flour on a plate, and then mix cornmeal, bread crumbs and salt and pepper on another plate. Dip tomatoes into flour to coat. Then dip the tomatoes into milk and egg mixture. Dredge in breadcrumbs to completely coat. Oooh, these are so good you’re gonna want to go out and strip your tomato vines, frost coming or no, just so you can make them! 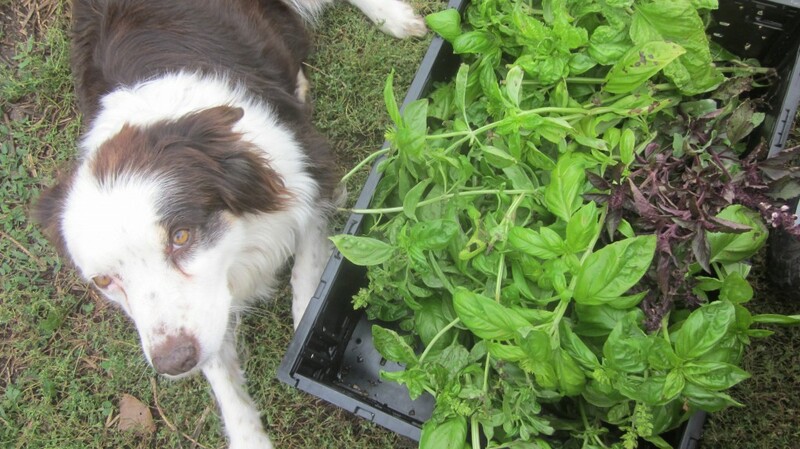 Here’s Bea and a nice harvest of basil, which I’ll make into pesto for the freezer this week. She’s pouting because I won’t let her chew on the baby opossum. For all his faults, Ollie really excels at proving his love for his ma. Me, that is. I’m linking this post up with The Prairie Homestead weekly Blog Hop! Come on over! 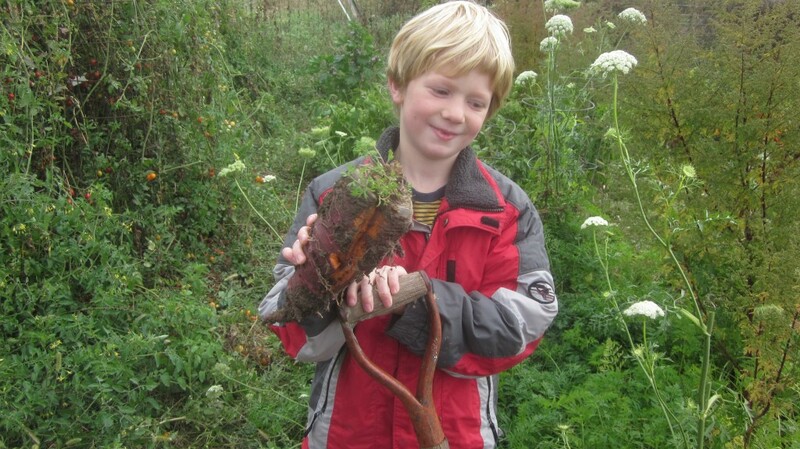 Also I’m joining up with Frugal Days, Sustainable Ways Blog Hop. ← Best way to store turnips for winter & a fabulous roasted root recipe! I look forward to reading more of your content, Not much of a cook myself mostly because I never had much experience or anyone teaching me. The best way to learn to cook, Jason, is just to find a cookbook that you fancy and read it! THen pick out a recipe or two to try. It’s not rocket science, and it’s fun! Next time I’m grumbling because I HAVE to go garage saleing for our business, I will tell the husband to find me a dead opossum and it should cheer me up! Anyway, that’s what I read!! – think he’ll buy it?? and yes, I LOVE fried green tomatoes!! 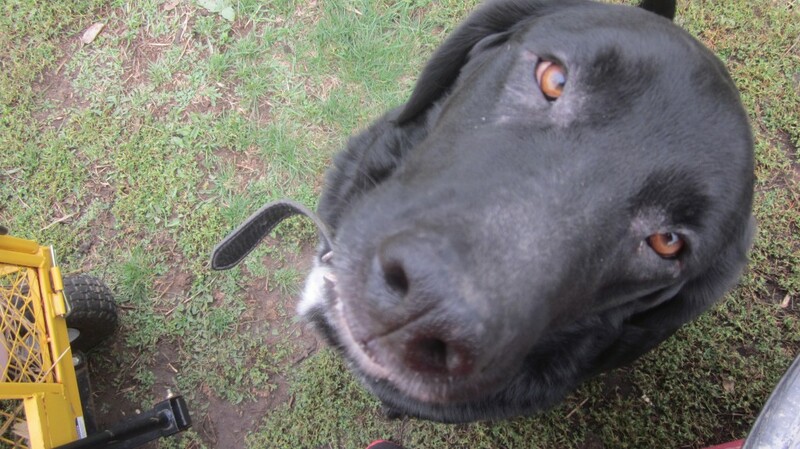 Have a great day – who knows where you’ll run across something dead in the yard?! I love your haul Amy. We have a lot of tomatoes still on the vine. We not nearly to winter yet though here in the desert of sunny southern California. I printed your tips for storage and I printed the recipe. I love how you made that printable with the push of a button. What a great idea that I have to learn how to do :-). I never enjoy finding dead animals of any kind because it means I have to dispose of it. With that said, I’d love to find the rats that caused damage under the hood of my car dead, dead, dead. It’s nice that Mack got distracted. Nice recipe although I do not like fried green tomatoes. As for your advise on storing green tomatoes – if there had been blogs 35 years ago I wouldn’t have found this all out “the hard way”. Sometimes the information sharing allowed by the Internet is priceless! I hear you, Alana! I’ve learned a wealth of “homespun” hints via blogs. Fabulous pictures. I don’t mind a dead raccoon or squirrel. We have plenty to spare and the squirrels usually eat the tulips in the Spring. Lovely post. It made me chuckle when you showed how a dead opussum cheered your little boy’s heart. I guess, it reminded him of the fragility of life–in a boy’s way of thinking of course. Your final crop is AMAZING. I could be so lucky if I grew a third of that all summer. Thanks Francene, that’s what I was going for–I thought it was fun, too, how finding that dead animal turned the day around! Anita-Clare, I’m with you on the workings of little boys’ minds being a bit of a mystery . . . but they are really a lot of fun! Ah… Had fried green tomatoes out last night. Glad to see they are popular all over. Noted your use of the coconut oil. Still haven’t picked that up yet! Ugh. Must do! I wonder if Mack realizes how cool his upbringing is?